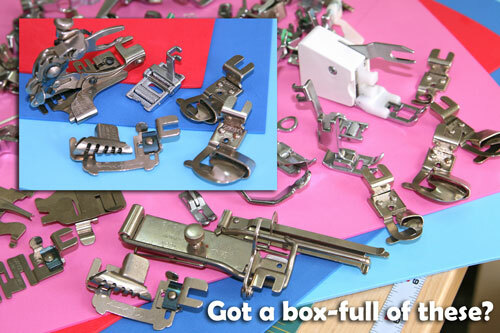 Ever wonder what all those gadgets are that came with your sewing machine? Is there life beyond the universal zig-zag foot? This class will introduce you to a wide selection of specialty presser feet for a lecture and demonstration of as many feet as possible during this 3 hour class. You will learn tips on selecting quality presser feet, tricks on using them for professional looking results and alternate uses for various feet. Students will determine which specialty feet will be discussed and demonstrated. Bring all your mysterious sewing machine attachments and learn what they are used for. Students may also bring their machines (in good working order) for a hands-on experience. This is a three-hour group class or a minimum one-hour mentoring session with the student(s) determining the specific feet to be demonstrated.